A project spearheaded by OBGYN Consultant Dr. Leon Dupuch, Consultant in the Obstetrics and Gynaecology Department, Princess Margaret Hospital has resulted in the department’s senior staff overseeing renovations to the hospital’s Labour Ward. Fast-track approval to facilitate the urgent facelift to the PMH Labour Ward was given the green light by PHA Chairman, Julian Rolle after plans were submitted to the Redevelopment sub-committee of the Board a little more than two weeks ago. The work, which according to Dr Leon Dupuch cost twenty-five thousand dollars ($25,000.00) and was undertaken using the Department’s own resources and private donations, was collected over several years. The renovations included replacing the flooring, upgrading the Nurses’ Station, and enhancing the aesthetic appeal of the ward. Dr. Dupuch noted, “Apart from changing the ambience, we have changed the workings of the labour ward in terms of how it’s run. Usually there are two beds in each room but what we are trying to do as best we can, is put one bed in each of the rooms so that we can now invite the partners. The newly refurbished unit will provide an enhanced experience for expecting mothers, allowing many to have their partners with them during the birthing process. “You know when you go private, your husband can come in with you to have your baby but now we are trying to encourage that on the public ward here. We’re also trying to start an epidural service as well, which we’ve never been able to do here and that’s going to be easier to do here with the single beds because with the two beds in each room obviously it got a little crowded,” Dupuch said. On Monday, Minister of Health, Dr. the Hon. 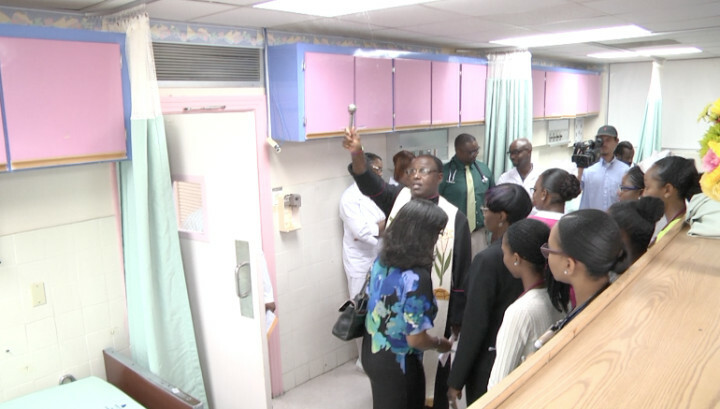 Duane E. Sands unveiled the improvements to Labour Ward while affording local journalist a tour of the improved area. Sands used the opportunity to also highlight other important projects including improvements to the Accident & Emergency Department and the completion of the hospital’s decanted spaces. “We’ve outgrown Accident and Emergency. So the first order of business is to expand it, give it a face lift an improve the staffing and equipment, but all of that in preparation for what’s coming with the brand new block and then the private services redevelopment is another project because the engine for revenue for PMH and PHA ought to be private services,” Sands said.